How is it Formed ? What are astrological benefits of Rhodochrosite Birthstone? Who can wear it and in which metal we should wear it? Rhodochrosite possesses great healing powers - It holds the delicate but powerful frequency that allows your mind to expand to a higher consciousness, encouraging you to combine feelings of love with like-minded actions. It is a manganese carbonate mineral of the Calcite group. It occurs mainly as massive aggregates or in granular, botryoidal, nodular or stalactitic forms, though rare, transparent rhombohedral and scalenohedral crystals are found. It forms in hydro thermal veins of copper, lead and silver mines, and as secondary deposits in sedimentary layers of manganese oxide. The name Rhodochrosite comes from the Greek rhodos, meaning “rose,” and khros, meaning “color,” and refers to its vivid pink to rose-red color. It has a vitreous and pearly luster, often banded in layers ranging from white or light pink, to those that are nearly red and opaque. Though most Rhodochrosite is in the pink to red color range, it can also be yellowish, orange or brown. It is often confused with the manganese silicate, Rhodonite, but is distinctly softer with white banding, rather than the black veins of manganese oxide present in Rhodonite.It is a recent discovery in the mineral kingdom. It comes in shades of orange and pink, and has stripes of various width in shades of white. Most Rhodochrosite comes from the United States or U.S.S.R. It is a very beneficial stone for those with asthma or other respiratory illnesses. It has a soothing and warming energy that helps you filter out the irritants that trigger respiratory difficulty. This also applies to the purification of the circulatory system and the cleansing organs, especially the kidneys. Rhodochrosite can help you alleviate irrational fears and paranoia. This ability to "see" things less negatively can also affect the eyes in a physical sense. Rhodochrosite will enhance the dream state, resulting in better sleep. 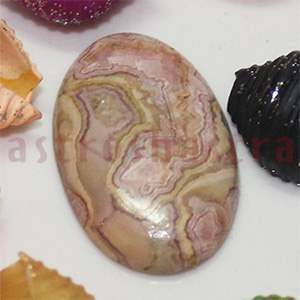 Gem literature suggests using Rhodochrosite in conjunction with Malachite or Copper. If worn, Rhodochrosite is most beneficial as a bracelet. It is suggested for those born under the sign of Cancer. 1. These stones help to relieve stress and balancing negative emotions. 2. They aid the emotions and creates a more positive outlook on life. 3. They help to connect the fiery energy of the sacral chakra with the heart. 4. It calms and rebalances the nervous system, which promotes feelings of deep relaxation, a welcome prescription for managing stress and intense emotions..
5. It gives us the wisdom to keep a healthy balance, protecting our spirit from bad vibes and giving us the courage to cut ties from people no longer serving us..
7. It attracts love by opening up the heart chakras with its healing vibrations.